LOOGGO USB Wall Charger Special Design and Perfect Compatible for iPhone, iPad, Samsung, LG, ZTE, Motorola, Android Cell Phone. [Wall Charger] High efficiency, Safety and Durability: -Intelligent IC identification technology, automatic detection of charging equipment, matching the optimal current output, powerful current, while meeting the use of two devices, save your valuable time! -Nokia, ZTE, TCL-ALCATEL, BLU, Blackberry, GPS, PSP, Sony PS3/PS4 Controller, Xbox One, Digital Camera, Tablet, Bluetooth Speaker, MP3/MP4 Players and more Android Phone and other USB Devices. Reliable Performance: USB Wall Charger with 100-220V wide voltage, suitable for the U.S. and the World electrical standards; 2.1AMP /10.5W stable output current, 8000+ times plug and play test, dual USB ports can be compatible with two devices at the same time. Special Design: The Wall Charger adopts Intelligent recognition of IC technology, automatic identification of mobile devices and matching the best current output.When the cell phone battery is full, it will automatically stop charging. Strong Safety Protection: USB Plug / Phone Charger Using premium fireproof PC material, the inside of the solid shell protection circuit. 5 kinds of protection measures to make the wall charger is safer (Short circuit, over-voltage, over-current, overheating and overcharge protection). Broad Compatibility: USB Charger perfect compatible with iPhone X 8 8 Plus 7 7 Plus 6 6 Plus 6S 5S 5 4S 4 SE, iPad Pro Air Mini 2 3 4; Samsung Galaxy S9 S8 Plus S7 S7 Edge S6 S6 Edge S5 S4 Note 5 Tab Series; HTC, LG, Nokia, Google, Nexus, Motorola, ZTE, OnePlus, TCL-ALCATEL, Blackberry, GPS, PSP, PS4 Controller, XBox One, Bluetooth Speaker, MP3/MP4 Players and more Android Cell Phone and Smart USB Devices. 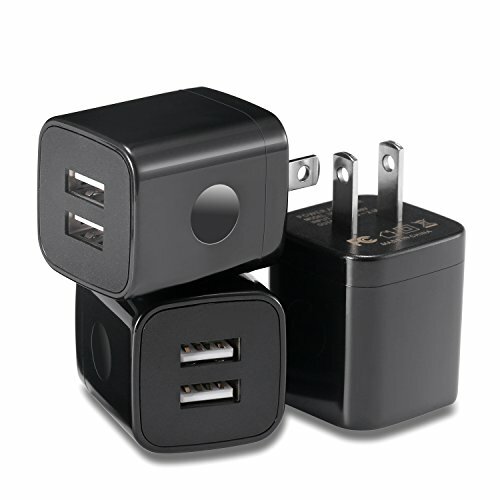 What You Get: 3-Pack USB Wall Charger (Black); Reliable and friendly customer service response within 24 hours,30 day refund guarantee.Whether it is your first purchase or you come back, please rest assured that we are together. All LOOGGO products are supported for 12 months warranty. If you have any questions about this product by LOOGGO, contact us by completing and submitting the form below. If you are looking for a specif part number, please include it with your message.